10.or D2 was launched in India last week, and today, it will go on sale for the first time in the country. Launched last year, 10.or (pronounced tenor) is an Amazon private label, under its Crafted for Amazon initiative. Like other smartphones from the brand, the 10.or D2 is is a budget offering, with prices starting from Rs. 6,999. On Monday, the smartphone will become exclusively available to buy for Amazon Prime members in a Prime Early Access sale at 12pm IST. It will become available for non-Prime members on Tuesday, August 28. 10.or D2 price in India starts at Rs. 6,999 for the base model featuring 2GB of RAM/ 16GB inbuilt storage and goes up to Rs. 7,999 for the 3GB RAM/ 32GB inbuilt storage variant. The smartphone will be available in two colour models – Beyond Black and Glow Gold – from August 28. Launch offers include 10 percent discount on Punjab National Bank credit and debit cards, 10 percent discount on IndusInd Bank credit and debit cards, up to Rs. 1,000 additional discount on exchange, Rs. 2,200 cashback from Reliance Jio, 95 percent off on Kindle ebooks up to Rs. 200, and no-cost EMIs. There is also 1-year additional warranty for Amazon Prime customers. The dual-SIM (Nano) 10.or D2 runs Android 8.1 Oreo with stock Android UI. The smartphone sports a 5.45-inch HD+ (720×1440 pixels) LTPS display with 18:9 aspect ratio and brightness of 400 nits. It is powered by the Qualcomm Snapdragon 425 processor clocked at 1.4GHz, paired with Adreno 308 GPU. 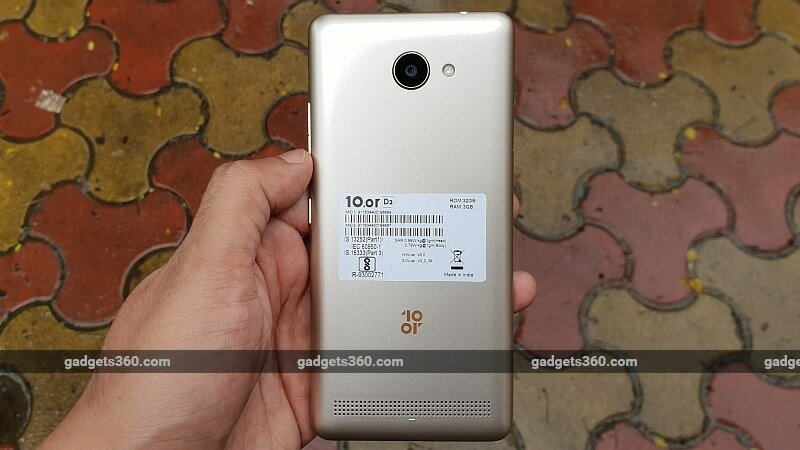 Additionally, the 10.or D2 comes in two variants – 2GB RAM and 3GB RAM. In terms of camera, the 10.or D2 comes with a 13-megapixel Sony IMX258 sensor with PDAF, f/2.0 aperture, and single tone LED flash. It comes with features such as HDR, low light enhancement, Beautify, and Panaroma feature. At the front, there is a 5-megapixel selfie camera with f/2.0 aperture and single tone flash. It boasts of features such as Selfie Countdown, Beautify, and Face Detection. The 10.or D2 comes with two storage options – 16GB and 32GB, both of which are expandable via microSD card (up to 128GB). Connectivity options in the smartphone include 4G VoLTE, VoWi-Fi, ViLTE, Wi-Fi 802.11 b/g/n, GPS/AGPS, GLONASS, and Bluetooth 4.2. The sensors onboard the handset are accelerometer, ambient light sensor, digital compass, gyroscope, and proximity sensor. It is powered by a 3200mAh battery, rated to deliver up to 19 hours of talk time, 8 hours of 4G internet use, 10 hours of Wi-Fi use, 70 hours of MP3 playback time, and over 20 days of standby time. In terms of dimensions, the 10.or D2 measures 147.7×70.5×8.6mm and weighs 144 grams. The handset comes with IPX2 water-protection rating.